Holly Petraeus: An Army Wife Takes Command David Petraeus is a celebrity general, respected by people on both sides of the aisle. And when it comes to protecting the financial interests of military families, his wife, Holly, is a force, too. 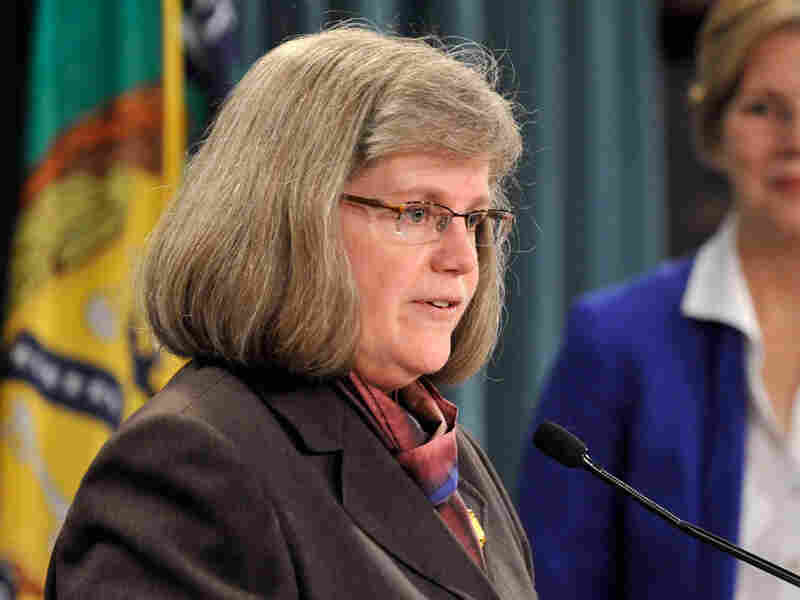 She's been tapped to head the new Office of Servicemember Affairs. "She's Mom, apple pie, and also a pit bull," says one former co-worker. One of the first people hired to work at the new Consumer Financial Protection Bureau is a small, quiet, unassuming woman named Holly Petraeus. She looks very mild-mannered. She looks very conservative, very reserved. But she's very passionate, and I think it's her passion for what she does that makes her so effective. And if the name sounds familiar, there's a good reason: She's married to Army Gen. David Petraeus, the U.S. commander in Afghanistan. 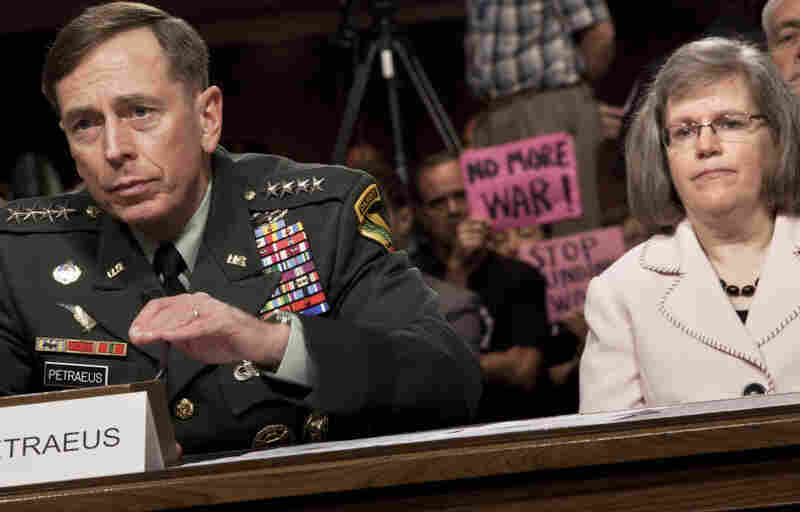 Gen. Petraeus is a celebrity general, respected by people on both sides of the political aisle. 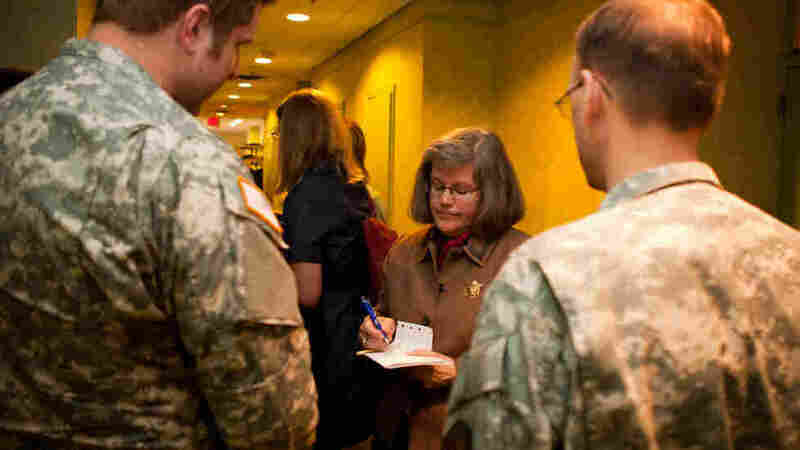 And when it comes to protecting the financial interests of military families, Holly Petraeus, 58, is a force, too. She will head the Office of Servicemember Affairs, within the consumer bureau created by Congress last year as part of the financial system overhaul. "She's Mom, apple pie, and also a pit bull," says Rod Davis, who worked with Holly Petraeus for six years at the Better Business Bureau. "You get her in your corner and watch her go." At the BBB, Petraeus led the Military Line program, which provides financial education and consumer advocacy for service members. "She looks very mild-mannered. She looks very conservative, very reserved," Davis says. "But she's very passionate, and I think it's her passion for what she does that makes her so effective." That passion comes from a lifetime of experience. Petraeus is the daughter of a general. Her son, brother, grandfather and great-grandfather all served in the armed forces. And she's been a military wife for more than 35 years. It's something that helps her connect with service members, like those at a listening session she held at Joint Base San Antonio back in January. "I know you out there in the audience look at me and think, 'That lady is really old. How could she possibly know what we're going through?' " she said to a room full of service members and others. But, she tells them, she and her husband were a young military couple once. "I know, hard to believe," she says, getting a few laughs. "We did some of the things that you know I don't recommend people do now — which is, buy the hot sports car, you know, sign the contract for the apartment sight unseen because they sent us a good-looking brochure." Petraeus knows the unique difficulties faced by military families firsthand. She has moved 23 times in 36 years and spent countless months raising a family essentially on her own while her husband was deployed. She says the military is a targeted population, because service members are often young and financially inexperienced. They get a steady paycheck, and under military rules can be forced to pay their debts. "Outside most large military installations, there's a strip, and it has the 'buy here, pay here' car lots, the pawn shops, the check cashers, in some cases the payday lenders," Petraeus says. "A new one on me when we went down to Norfolk recently was a place where you can rent rims for your car." Steering service members away from bad financial decisions is one of the many things Petraeus will work on in her new job as head of the Office of Servicemember Affairs. How she got to this job is a story in itself. "I have a very nonstandard resume," Petraeus says. When she was first married, Petraeus worked an assortment of random civil service jobs at the bases where her husband was stationed. Then, she took time off to "do the mom thing" and did volunteer work at the Army posts. Some 20 years later — without even applying — she was offered the job at the Better Business Bureau. "I think any military spouse ... should be heartened by me," Petraeus says. "I am true evidence that years of volunteering can actually translate into a paid job." Then late last year, Petraeus went to talk to White House adviser Elizabeth Warren, who is setting up the Consumer Financial Protection Bureau. They talked about what the bureau should be doing for military families. It wasn't a job interview, but Warren said she was so impressed, she knew immediately that Petraeus should head the Office of Servicemember Affairs. "They have the right person in the right place, in terms of having Mrs. Petraeus," says Katie Savant, who does government relations for the National Military Family Association. Savant says it's still not entirely clear what the new office is going to do. There are already numerous other programs out there designed to help military families navigate financial pitfalls and report rip-offs, she says. "I think there are some redundant programs that are out there now," Savant says. "We hope that this new office will not be a redundant program, and that it will actually kind of provide one centralized place for the information." The Office of Servicemember Affairs opens for business in July. One thing it will have that many of these other programs do not is the power to enforce consumer protections. And as one of her friends put it: The office will also have the "power of Holly Petraeus."